A friend brought in Patty’s cupcakes to work and I just had to try more of them. I purchased the peanut butter & chocolate and red velvet cream cheese cupcakes. My roommate fell in love with the pb & chocolate and I fell in love with the red velvet (the cream cheese is SO good). The cake balls are also fun and delicious. The second you walk into the shop, Patty makes you feel instantly at home and welcome. And the cupcakes are so gosh darn cute! I will definitely be going back to try more! 08/26/2011 - Amy - Fullerton, CA - via Yahoo! The cupcakes were very tasty and the service was great. I will definitely return. 08/28/2011 - 5150 - Fullerton, CA - via Yahoo! Well I can say I have a favorite cupcake now. It is the Chocolate Caramel Salty! Chocolate cake with a fudge, caramel, and sea salt topping! Yes, sea salt! WOW! My daughter loves the red velvet with the vanilla topping. She is now also a fan of the caramel and sea salt. Thank you Patty! Thanks for the good customer service everytime as well. Oh and thanks for making that one Lemon Cake Ball for Tasha D a couple of weeks ago. She loved it! Patty’s Cakes and Desserts ROCKS!! Beverly’s Best and Frostings cannot compete with Patty’s cupcakes. They are moist and divine. Even better, they are located right around the corner which can be quite dangerous. National Cupcake Day Sale! Buy One, Get One Free! 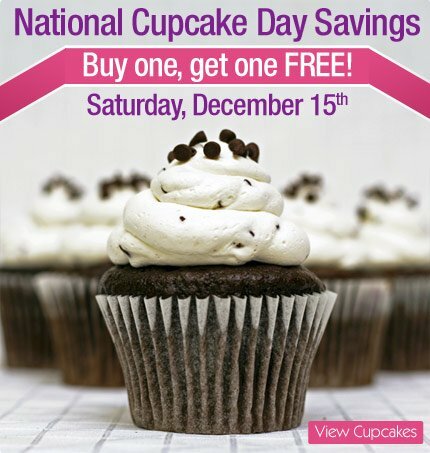 Mention the “National cupcake day sale” when buying a cupcake and receive your second free! Limit 4 free cupcakes per person. Cannot combine with any other offers. Sale valid on Saturday Dec. 15, 2012 only. Hey, I just wanted to thank you and your staff for making my wedding cake it was so yummy and looked very beautiful. I’ll mail you some pics this week or come by. Thanks again, you guys are the best cake place ever!